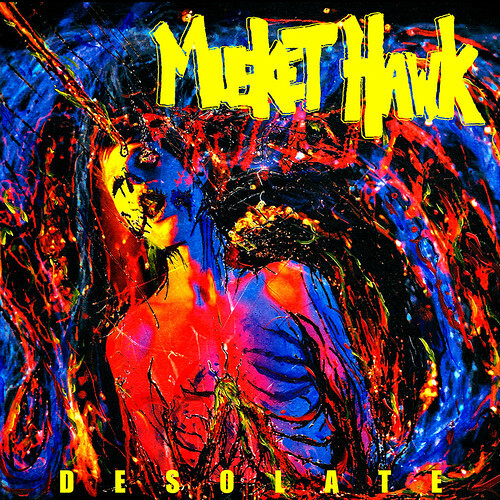 Baltimore’s Musket Hawk put out a a full length in May titled Desolate, despite the quite vibrant colors in cover art. 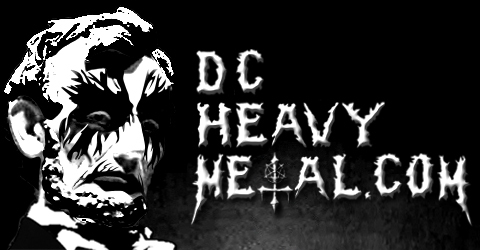 DCHM reviewer Buzzo Jr spent some time with the album and wrote the following review of it. Be sure to stream a few songs at the end of the post as well! Baltimore’s own sludge/grind trio Musket Hawk are back with Desolate; their second full length album since their self released debut, The Form of Disgust, from three years prior. On their newest release, the dudes in Musket Hawk go full throttle with an intense mixture of sludge, grindcore, and stoner metal. Sludge and grindcore are two of my favorite subgenres of metal, so it’s always great when more bands successfully merge the two together. Musket Hawk’s Desolate is a perfect example of this fusion of genres done right. The album starts off at a speedy pace with the first two tracks “Pollute Your Throat” and “Reluctant Punk;” both filled with fast, heavy riffs and rapid blast beats interspersed with slower sludge based sections. The next two tracks “Jeweler” and “The Grove” are more mid paced tracks, with “Jeweler” being centered around a grooving breakdown while “The Grove” opens up with a great deal of black metal influence in its riffing structure. Marty Spiro’s guitar work on here is superb, laying down thick riffs that intertwine with Gary Fry’s fuzzy basslines. One of the standout elements of this album are the dual vocals of Gary and Marty; interchanging between deep low gutturals and sharp high pitched screeches. While more grind oriented in nature, the vocals also lend themselves to the more sludge based sections of the albums as well. At times they almost sounded like the frantic cries of a wounded animal; perfectly adding to the grimy atmosphere that the riffs already provide. While the first four tracks on the album were much more crusty and murky, the second half of Desolate begins to flirt a bit more with melody and stoner rock influences. The B-side begins with “Connois Sewer,” a track that opens with some melodic guitar lines before exploding back into the heavy riffs of previous tracks, although a good deal of melodic undertone is layered into the remainder of the song. “Space Ray Houska” soon comes up next, a track that showcases some post rock elements at its mid way point. Jason Goodman’s drumming on this track is great, transitioning between mid paced d-beats, to slow primal thuds, to all out blast beats. While the drumming is great from a technical standpoint, they did seem to sound a tad wooden when it came to the bass pedal’s sound, but other than that I can’t find any issue with them. My favorite track on Desolate is the seventh track, “Tweed After Dark;” another faster paced track that has an epic melodic line coursing through the song along with the pummeling riffs, giving it an almost Iron Maiden meets High On Fire type vibe. The album comes to a close with the six minute “Candidate For a Knife”; a massive slab of sludgy riffage that goes from a slow doomy dirge, to hyperspeed grind and back again. Musket Hawk’s newest album is a brilliant fusion of some of the most abrasive genres in modern metal, and at the same time is an album that has a great deal of amazing melody at its forefront. Definitely give this album a listen if you are a fan of grimey, dark sludge and grindcore, and be sure to catch Musket Hawk on the 22nd of July when they play with the legendary Belgian band Agathocles at the Windup Space in Baltimore (details here).